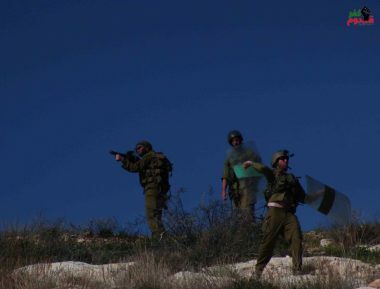 Israeli soldiers injured, Friday, several protesters, in Kufur Qaddoum town, east of Qalqilia, in the northern part of the occupied West Bank, after the army attacked the weekly nonviolent procession. Morad Eshteiwi, the media coordinator of the Popular Committee against the Annexation Wall and Colonies in Kufur Qaddoum, said the hundreds of Palestinians, accompanied by Israeli and international peace activists, marched from the center of the village, heading towards the Wall. He added that the soldiers fired dozens of live rounds, gas bombs and concussion grenades, causing dozens to suffer the effects of teargas inhalation. The protesters chanted against the ongoing Israeli occupation and illegal colonialist activities, and the illegal declaration of U.S. President Donald Trump, recognizing occupied Jerusalem as the unified capital of Israel in direct violation of International Law, and numerous United Nations and Security Council resolutions. The weekly protests have also been ongoing for several years against the Annexation Wall, and the continued closure of the village’s main road, which was blockaded fourteen years ago, to enable easy access to colonialist settlers, driving to and from the illegal Kedumim colony, which was built on private Palestinian lands. Also on Friday, the soldiers attacked the weekly nonviolent procession against the illegal Annexation Wall and colonies, in Ni’lin village, west of Ramallah in central West Bank, causing many protesters to suffer the effects of teargas inhalation. In related news, dozens of Palestinian, Israeli and international peace activists held the weekly nonviolent procession against the illegal Israeli Annexation Wall and Colonies, in Bil’in village, west of Ramallah. Furthermore, the soldiers assaulted dozens of nonviolent protesters in al-Biereh city, in central West Bank, causing many to suffer the effects of teargas inhalation, and attacked many journalists. In addition, the soldiers attacked dozens of nonviolent Palestinian and international protesters, in Budrus village, west of the central West Bank city of Ramallah. The soldiers also injured at least twenty Palestinians in the al-‘Isawiya village, in occupied East Jerusalem.